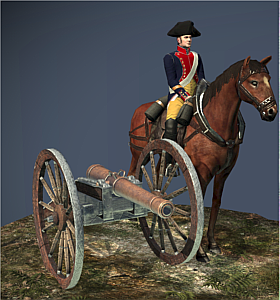 The cannon used by horse artillery lack range and firepower compared to other artillery pieces. This is considered unimportant; speed is all! Horse artillery units can move guns to a firing position, deploy, and then remove themselves with some despatch. They can be where they are needed to support and attack or break an enemy advance. They are a tactical reserve that any general will welcome, or a means to exploit a weakness in the enemy line. Historically, Frederick the Great of Prussia observed that even the smallest artillery piece could be enough to break enemy defensive formations, leaving them open to subsequent attacks by infantry. He concluded that speed and mobility, rather than simple weight of shot, was important. This observation lead him to order the development of a ‘galloper’ gun, and a six-pounder that could be dragged at the gallop. Frederick’s contribution to military tactics was acknowledged by Napoleon himself, who considered the king a master tactician.